Pegasus, the Flying Horse, stretches from left to right, its most obvious feature the Great Square seen to the left of center, here oriented as a diamond. The bright star toward the left edge is Alpheratz (Alpha Andromedae), which connects the Great Square with Andromeda. 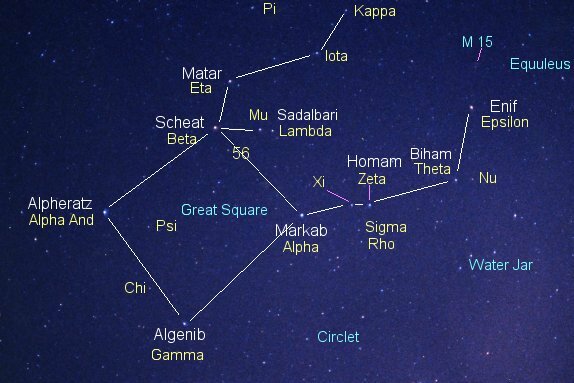 Scheat, Beta Pegasi, is at the top of the Square, with Mu and Lambda just to the right of it, while Algenib is at the bottom. The constellation continues to the right of Markab at the right-hand corner of the Square ending in Enif, the bright star toward upper right. Matar is just above and to the right of Scheat. To the immediate right of Markab are Xi Pegasi and Homam (Zeta). The pair of stars that make Pi Pegasi is at the top center edge of the picture and also appears on the image of Lacerta. The "Water Jar" of Aquarius is below Enif, the "Circlet" of Pisces is below Markab, while the quartet of stars that make Equuleus is at the upper right corner. The globular cluster M 15 is the top of the two faint "stars" up and to the right of Enif.